I absolutely love going to the swap meet. Growing up in San Diego, my dad was at Kobey's Swap Meet at the San Diego Sports Arena nearly every weekend, sometimes buying, sometimes selling. I'm pretty sure this is where the "thrill of the hunt" seed was planted in me, I absolutely love searching for treasures, diamonds in the rough. 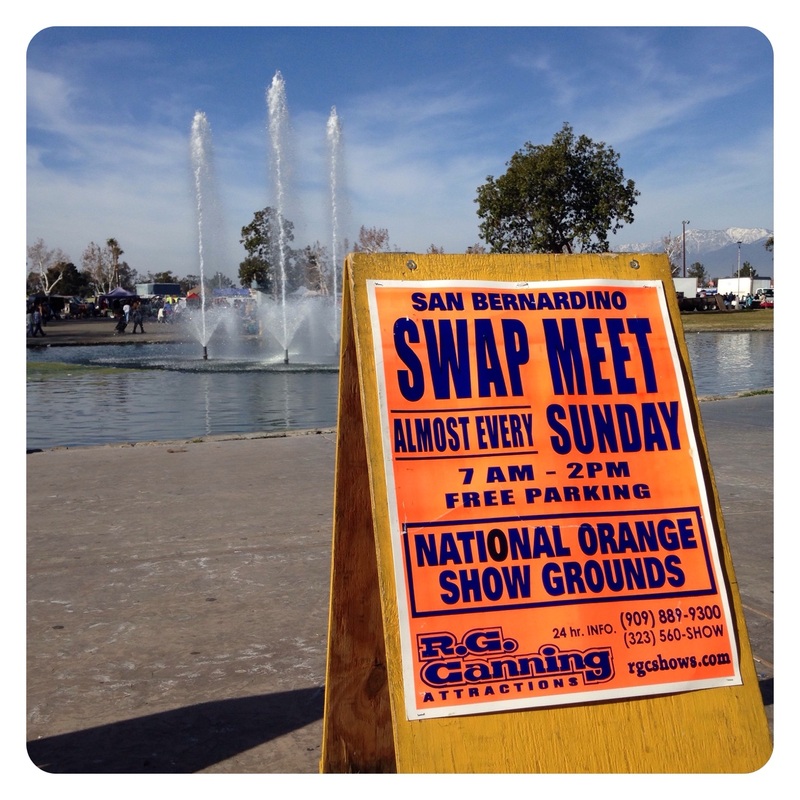 While Kobey's had segregated "old" and "new" sections of the grounds, unfortunately many contemporary swap meets are mostly "new" items and of zero interest to me. 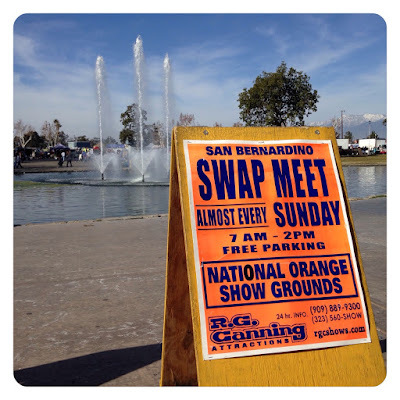 I've permanently crossed many local swap meets off of my list because of this, but there is one nearby that never disappoints -- the San Bernardino Swap Meet at the National Orange Show Fairgrounds. 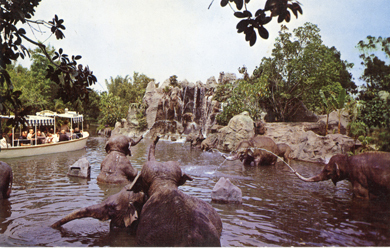 From the treasures waiting to be found to the characters you're destined to meet, it's very reminiscent of the countless weekends wandering the aisles with my dad. This swap meet is massive. We usually go about twice a year, and always find something special. Last Sunday was our first outing of the new year, and we came away with a ton of great stuff, including a set of Jarts lawn darts, a clay wheeled skateboard, and, of course, some wonderful postcards to add to my collection. I'll likely share all of them here at some point, but I'll begin today with this set of Disneyland postcards from the 1970s. 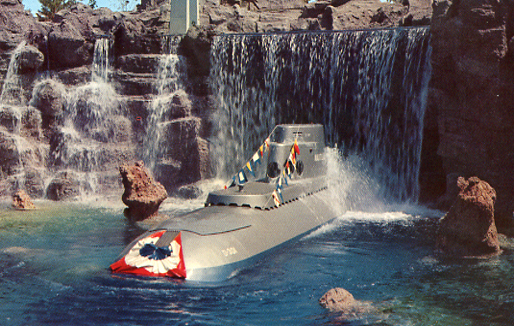 The mysterious depths of the legendary Seven Seas have been brought to reality for passengers aboard one of Disneyland's air-conditioned submarines. Guests enjoy looking through portholes to view an underwater panorama of sunken treasures, mermaids, a sea serpent, and beautiful floral and fauna of the underseas world. 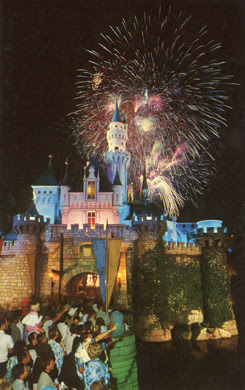 Brillant "Fantasy in the Sky" fireworks burst over the Disneyland Castle every summer evening as a part of the show in "Disneyland After Dark." 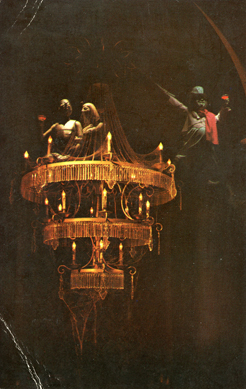 A ghostly ball reaches its height as frolicking spirits perch, precariously, on a huge chandelier. They are just a few of the 999 fun-loving ghosts in Disneyland's Haunted Mansion. 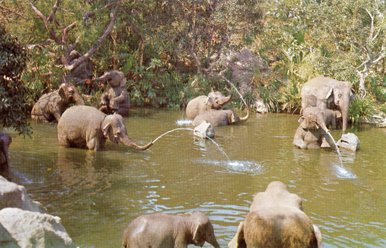 Playful Indian elephants, at home in their own enchanted bathing pool, have a trunk full of watery surprises for guests on a cruise down the Rivers of Adventure in Disneyland. 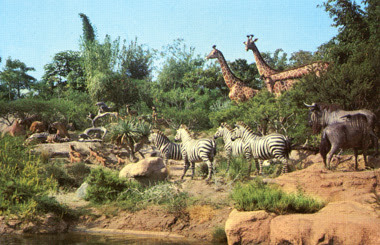 Gazelles, gnus, zebra, lions, and giraffes tell the story and point up the law of the jungle... survival of the fittest... in this expansive grassland region along the banks of the Rivers of the World in Disneyland's Adventureland. 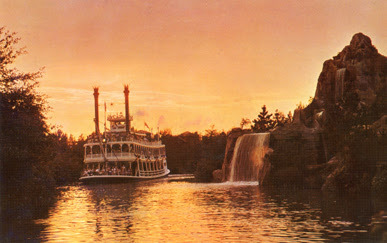 Dusk comes to Frontierland as the Mark Twain steamboat makes its way past Cascade Mountain on a peaceful trip along the banks of the Rivers of America. 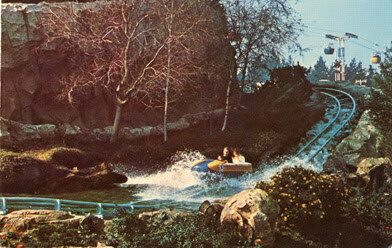 A bobsled finds a watery surprise in a glacial lake after twisting and careening down the icy Matterhorn Mountain. 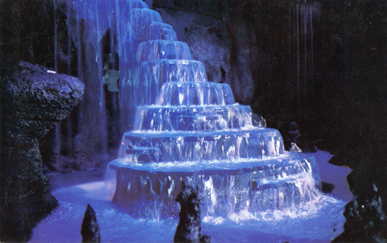 The Rainbow Ridge Mine Train takes guests deep into underground caverns where breathtaking waterfalls, multi-colored stalactites and stalagmites are seen inside beautiful Rainbow Caverns in Frontierland. 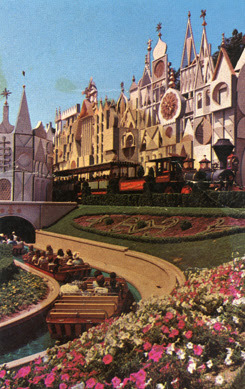 Along the winding Seven Seaways, guests embark on the "Happiest Cruise that ever sailed" -- Disneyland's exciting musical fantasy, "It's a Small World." Greetings from Breton Woods, N.J.